To tell the story of this year's trade show instead of using a video as we have for the past two years it was decided that a visual panorama of each of the display areas might give you a good idea of what things were like. The images at the top and bottom of the page are QuickTime VRs and require a current version of QuickTime loaded in your computer to display the interactive images. Just place your cursor on the image and take a look around. The shift key should zoom in and the control key should zoom out. The image at the bottom of the page is in a higher resolution. 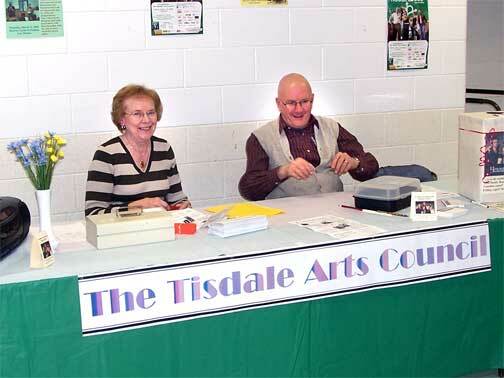 Mrs. McPhee was on hand (right) at the Tisdale Arts Council booth in the main lobby and many of Tisdale's service clubs were represented with boothes. This year's trade show is puzzling because this past crop year is probably historically the most profittable ever so that there is more cash available this year then ever before yet the show seemed muted, almost a shadow of itself to what it has been in other years. Not only were the displays toned down but the number of displays and participating merchants seems lower than other years. It was no surprise that the Member of the legislature for the area who was at both previous trade shows as a prospective candidate was not on the scene Friday afternoon. He wasn't the only one who seemed to have decided to avoid the show because the crowd was extremely light and I was on hand about the middle of the afternoon when it should have been the busiest.